As some of you may or may not have noticed, I have been afk for while. For the non-geeks among you: afk means away from keyboard. 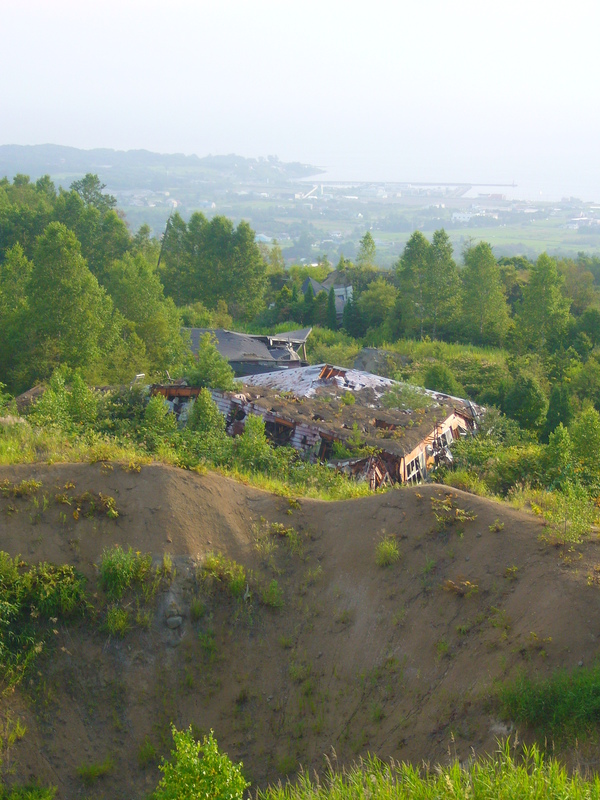 The reason was our trip to Hokkaido, the northern most island of Japan. Like many Japanese companies, Toyota had decided to send all of their employees on a mandatory holiday around mid August. To avoid the crowds, we decided to go the most remote Japanese destination we could think off: Hokkaido. Further more, we were looking forward to spending some time in a refreshing 30°C atmosphere instead of the scorching 36°C of Nagoya. 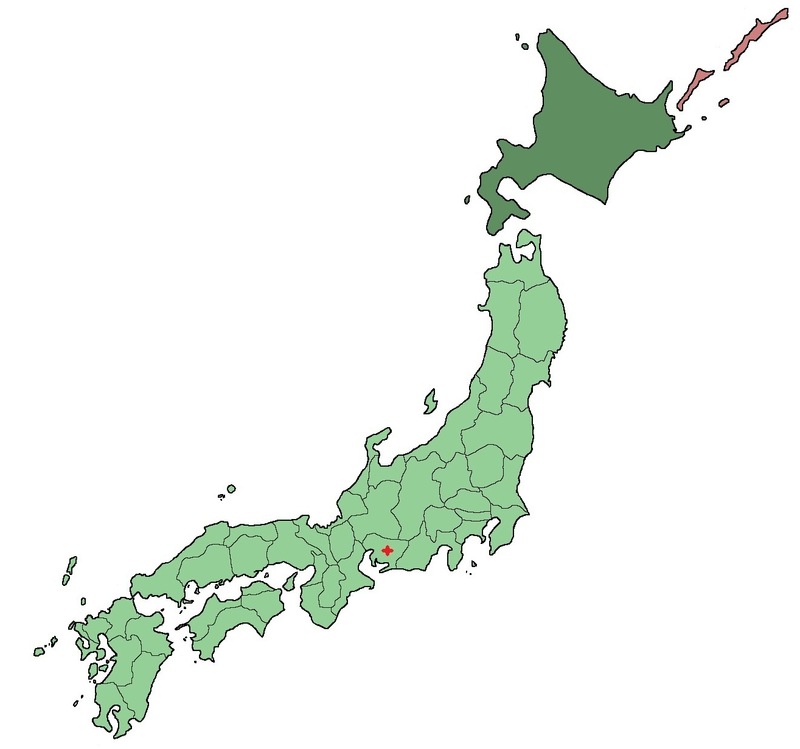 Hokkaido is the northernmost island of Japan, marked in dark green. The tiny red cross indicates where we live. I can wholeheartedly recommend Hokkaido (in summer) to anyone who likes any or all of the following: lakes, mountains, volcanoes, onsen, forests, seafood, wildlife (not necessarily in that order). I guess in winter it’s mostly nice for people who like snow. It was a great trip. We got to see Japanese minshuku and youth hostels from the inside for the first time; an experience that deserves it’s very own blog post later on. The food was delicious, with a lot of fresh fish and seafood and a dish with mutton and cabbage called Genghis Kahn. The nature was overwhelming. We bathed in a natural onsen by the lakeside.We walked trough forests and wandered along the shore of beautiful lakes. 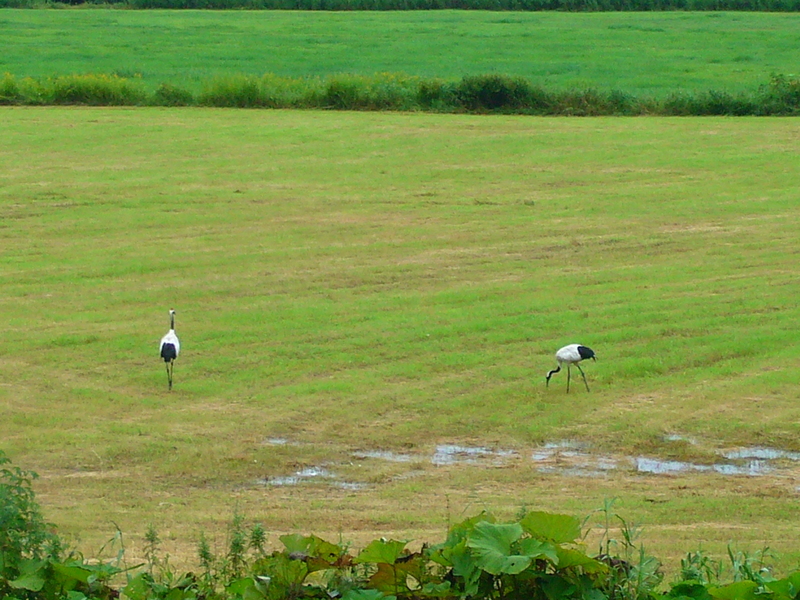 We met a host of wildlife that we’d never seen before, like cranes, chipmunks, dolphins and a fox. Fortunately we didn’t run into any bears. 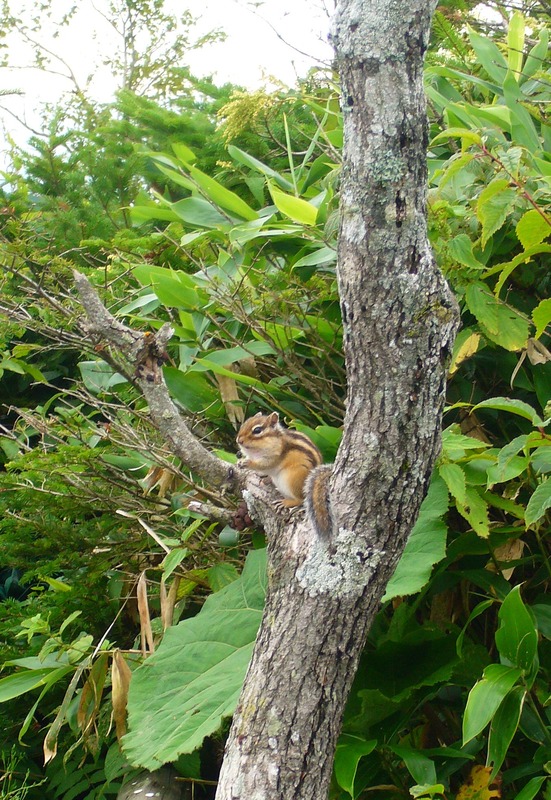 The chipmunk has the children eating out of his hand – or was it the other way around? 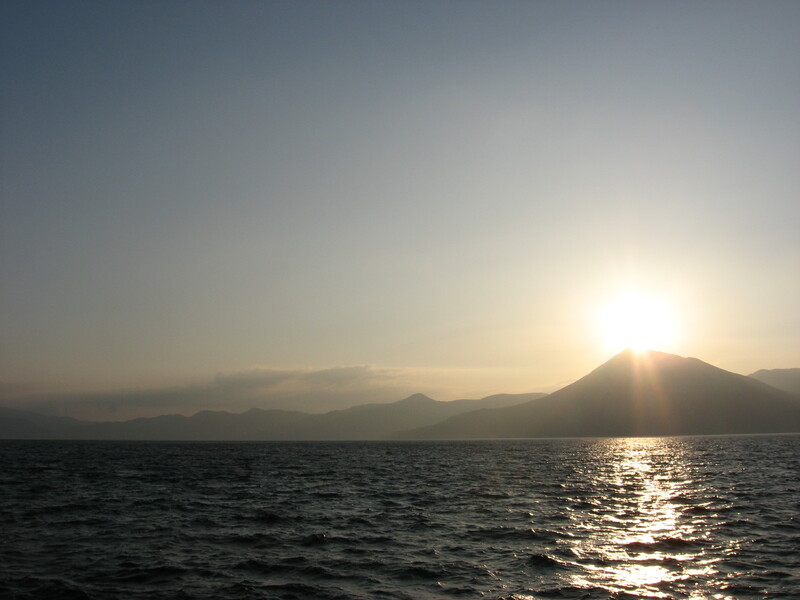 Whale-watching trip in Muroran. We didn’t see any whales but there were a lot of dolphins. And then there were the volcanoes. I had never seen an active volcano up close before. It was overwhelming, almost like an apocalyptic scene. 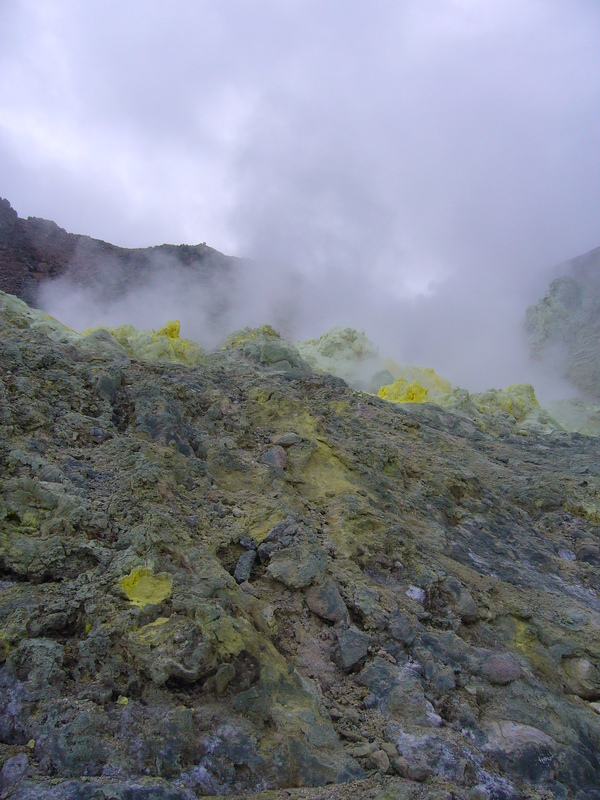 A barren rocky landscape with blotches of yellow left by the sulfur. Hissing steam escaping from the rocks and the smell of rotting eggs (from the sulfur). Apparently this is what hell is supposed to smell (and look?) like, only worse. Again I was confronted with the fact that the earth which seems so stable to us most of the time, is actually a living thing of sorts. One of the volcanoes we saw just popped up out of a vegetable patch some odd 60 years ago. Another one violently erupted in 2000 and turned a lively little town into a post-apocalyptic ghost town that is now visited by tourists. 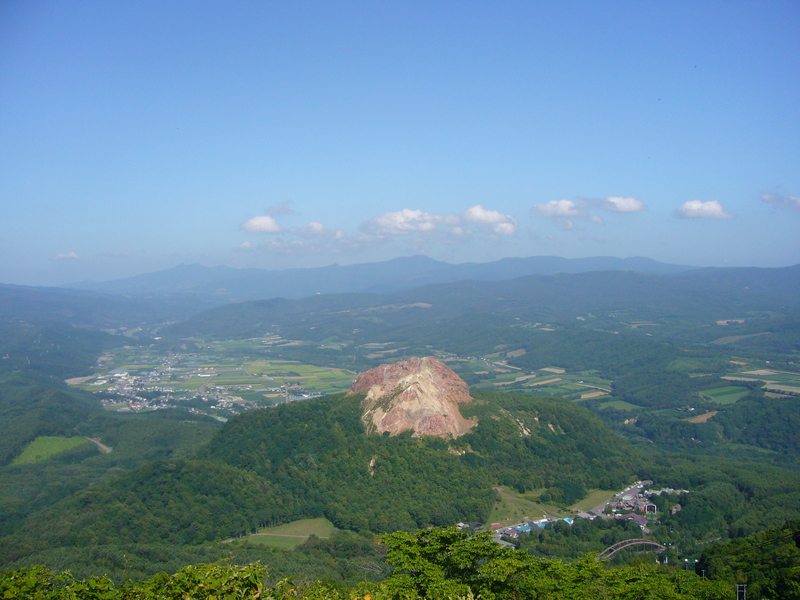 It made me think of Hokkaido as the birthplace of the earth. This also relates to the relationship that the Ainu, Japan’s indigenous people who now mostly live in Hokkaido, have with nature and the earth. Hokkaido, with its mountains and forests, covered in mist and clouds, seems like a mystical place to me. 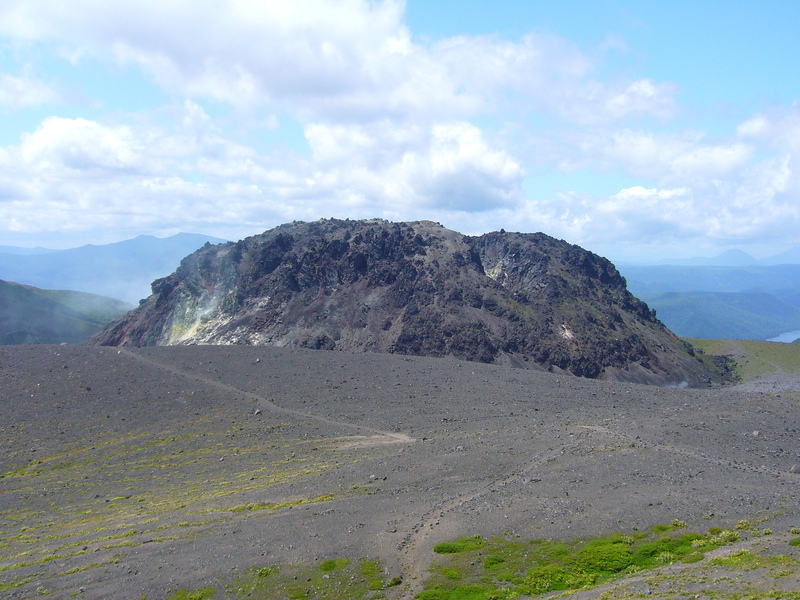 Mysterious things such as the birthing of the earth from an active volcano definitely seem possible here. 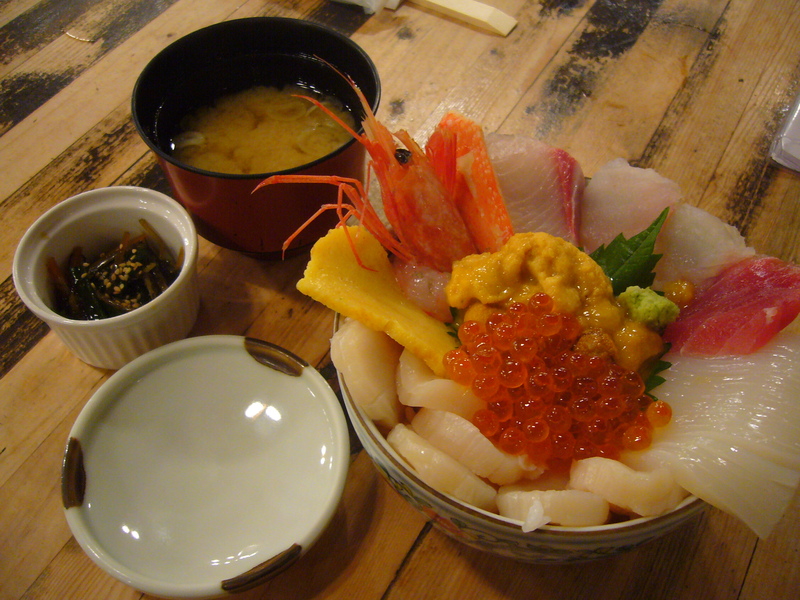 This entry was posted in Japan, Travel and tagged Animals, Fish and seafood, Food and drinks, Hokkaido, Nature, Summer, Volcanoes by Haruko-chan. Bookmark the permalink. Sounds like a really nice trip. I’ve been to Hokkaido only once myself and it was in the summer. Would love to go back esp. for the food. Yes the food is great! I’m thinking of making an extra post just about the food. Is there a follow-option on your blog? I didn’t find it. Yes, there is, I believe, the “follow” option. 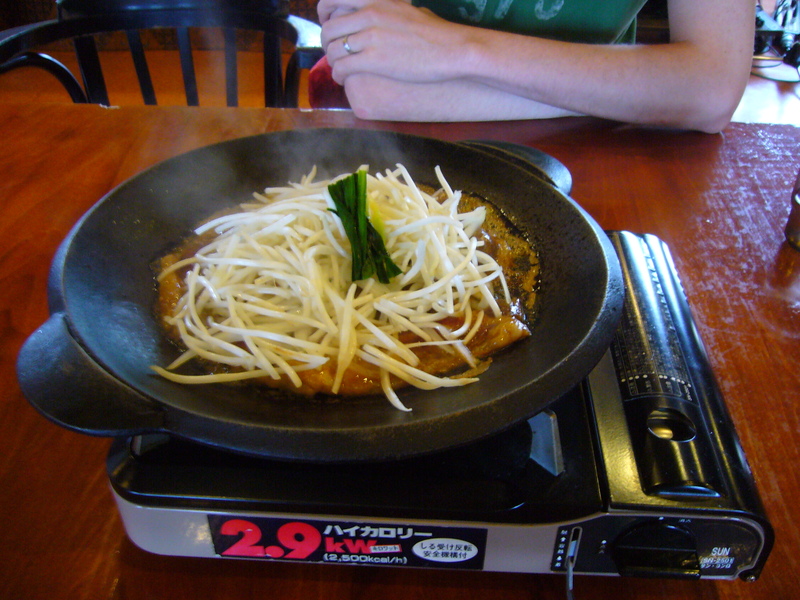 Food blogs are always great, and food pix from travel as you tend to go the extra mile to try and have special dishes. My habit of taking food photos started from being on trips in the days of film before digital cameras. What is it like to go to an onsen during summer? Is it too hot? It looks really nice though next to the lake…. Actually onsen is also really nice in summer. When you’re all sweaty and dust-covered from the summer day and your body feels weary, onsen is refreshing. 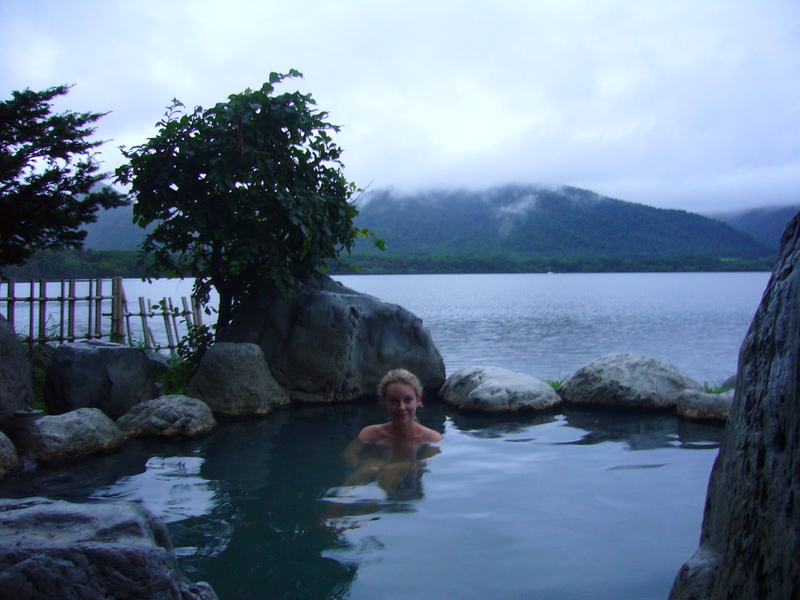 When we were in the onsen in the picture it was raining a little bit, so it made the warm water even nicer. 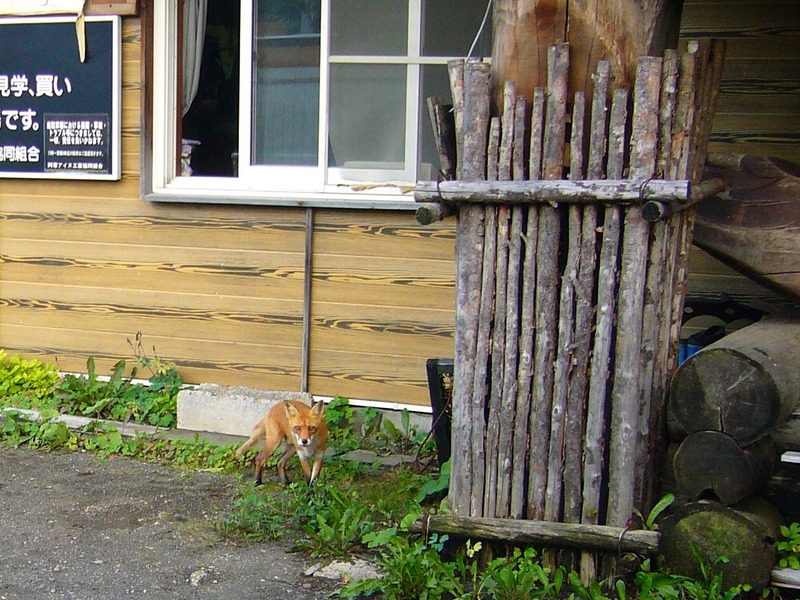 But before going to the onsen in the picture, we went to another one and that one really was too hot. I think it was around 50°C or a bit more. The Japanese just went in like it was nothing but when I put my foot in for 2 minutes, it felt sunburned afterwards. Winter or summer, that’s too hot for me. Absolutely gorgeous pictures – very vibrant (even the food)! Thanks! I liked the story about your brother on your blog.